Kettlebell workouts are a very popular way of workout for a good reason. These exercises combine cardio and strength training, burning calories faster. Using kettlebells can result in amazingly high number of burnt calories. According to a study by the American Council of Exercise, an average person can spend as much as 400 calories in just 20 minutes using kettlebell exercises. It has also been proven that regular kettlebell exercises can drastically reduce back, neck and shoulder pains by improving the strength of upper body and core muscles. All of this provides a convincing argument for adding more kettlebell exercises in your workout. We offer you a list of 5 kettlebell exercises, with tips on choosing the right kettlebells, and a tutorial covering the basics. If you’re new to kettlebell workouts, you should know that these exercises take a lot more attention than the simple weight lifting. In many of them you’ll do swinging moves, so it’s imperative that you learn how to handle them properly and avoid injuring yourself. Always begin with lighter kettlebells to determine whether the size is right. After determining the appropriate weight, you can start your kettlebell workout. – Take the kettlebell in your right hand. Slightly lift your left foot off the ground. – Start leaning your torso forward, and at the same time extend your left leg behind you keeping it in line with your body. Use it to balance yourself while lowering the kettlebell toward the ground. – Remember to keep your back straight. Hold, and return to the initial position. – For better results, keep the heel of your right foot slightly off the ground, with slight bend in the knee. – Do three sets with 12 reps for each leg. This move can be very demanding for your arms, but as a result it greatly increases their strength, making them muscular and well defined. – Start by lying on the back. Take the kettlebell in your right arm and raise it upwards, bending your right knee. Keep your left arm on the floor to the side. – Constantly looking at the hand holding the kettlebell, come to a sitting position, with your arm still up. Use your left hand as a support for the next move. – Pressing down onto it, slowly raise your pelvis. – Take your left leg backward under your body, placing the knee under your left hip, and put all the weight on it. Keep your right arm in the air and the left on the floor so that they form a straight line. Supporting on your left hand keep your eyes focused on the kettlebell. – Push your torso up with your left hand, keeping the weight of your body on the left knee and right foot. – Slowly stand up, bringing the left leg forward. – Your right arm is still up, with your eyes fixed on it. Do the movements in reverse order, returning to the initial position. – Do 6-8 reps with one arm, and another 6-8 for the other. This exercise is excellent workout for the quads and glutes. It can also be done using a dumbbell, yet performing it with a kettlebell is more challenging for your muscles and balance. – Take a standing position with your feet wide. Take a kettlebell and hold it in front of your chest with your palms turned towards you. – Still holding the kettlebell in front of you slowly lower yourself in a squatting position, making your thighs parallel to the ground. Hold this position for a while, and rise up. Do 20-25 reps. This demanding kettlebell exercise works your whole body. It is primarily focused on the obliques and torso, hence it’s very effective in reducing the waistline quickly. – Stand with your legs wide. Your feet should be positioned wider than your hip distance. Hold a kettlebell in each hand. – Slowly raise your right arm above your head, rotating your left toes outward. Keep your eyes fixed on the weight. – Shift your hips to the right. Remember not to swing your pelvis behind you as you position yourself. – At the same time, also shift your weight slightly to the right. In this position about 60 percent of your weight is supported on the right foot. 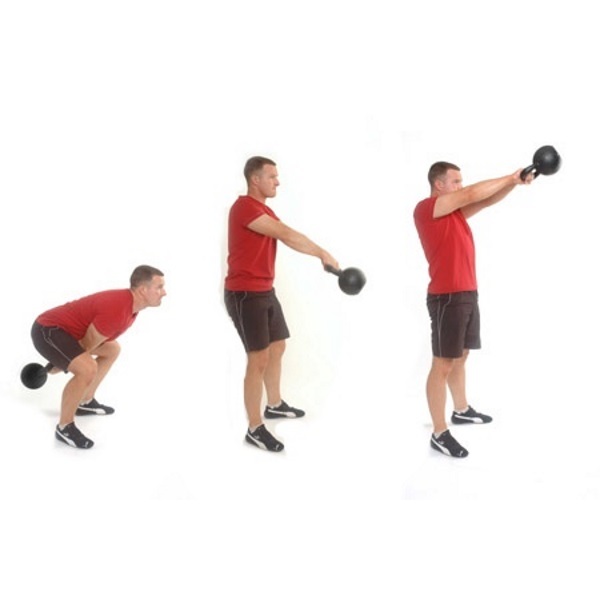 – Lower the torso towards the left foot, taking the kettlebell hovering of the floor. – Focus on keeping your whole body as flat as possible. The raised right arm and the left arm should form a straight line. – Once in this position slowly take your left hand to your left shoulder. – Come to a standing position still holding your right arm up, and your left arm on the shoulder. In doing so, you rely on your waist to move your torso. – Rotate your left foot so that it points forward, distributing your weight evenly on both feet. – Raise your left arm over your head. Bring it back to initial position and repeat. Change arms. This exercise is focused on working your back and shoulders, and works on the core muscles too. At the same time, it increasing the heart rate, making it pump harder. Remember to hold the kettlebell tightly to avoid losing control. The exercise relies on an doing an explosive swing when you come up from your squat. – Stand with your hips positioned wider than the hips. Lower into a squat, holding the kettlebell between your legs with both hands. Keep your back straight, and rely on the abs for support. – Your next move should be explosive. As you inhale stand up pressing on your feet and straightening your legs. Swing the kettlebell in front of your chest, expanding your arms in straight line with your shoulders. – As you exhale, lower again to the initial position, swinging the kettlebell between your legs. – Do three sets of 12-15 reps. If you want to learn more effective kettlebell moves, watch this video. The video presents some of the moves described above as well as some new moves. In the video you have everything you need for a quick muscle building and fat burning workout.